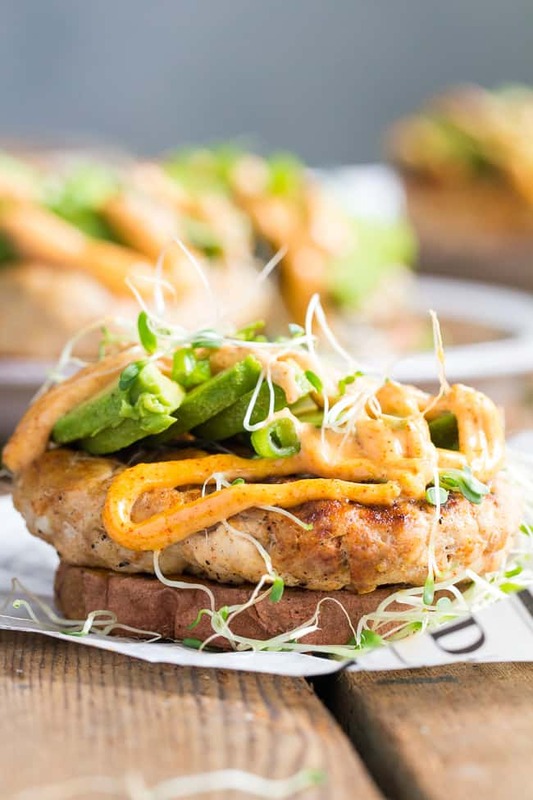 These Chipotle Ranch Chicken Burgers are loaded with your favorite flavors and perfect on a grilled sweet potato bun! 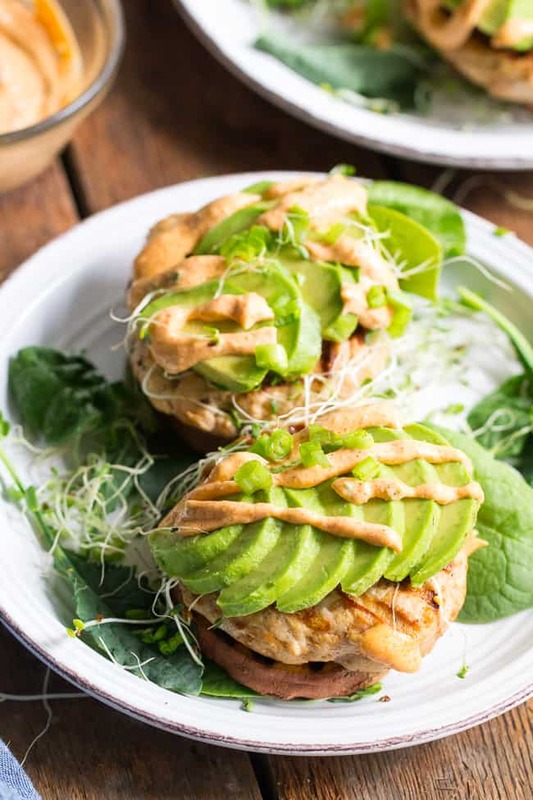 Topped with chipotle ranch sauce, avocado and sprouts for a delicious, fun, and healthy burger that might become your new favorite! Paleo, Whole30, gluten-free, dairy-free. Did you know I had no idea ground chicken even existed before going paleo? Weird, because ground turkey was a regular item in my fridge, yet I never thought to look for ground chicken let alone make a burger with it. In fact, it wasn’t until I decided to try making my own chicken apple sausage patties that I really started to experiment with ground chicken. And you know what?! I LOVE it. Not just me, my whole family loves chicken sausage patties and burgers WAY more than ground turkey. 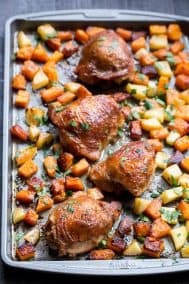 It might be the fact that I buy the ground thighs usually, but, even when I get a leaner version we all agree it can do no wrong – especially with the right seasonings. 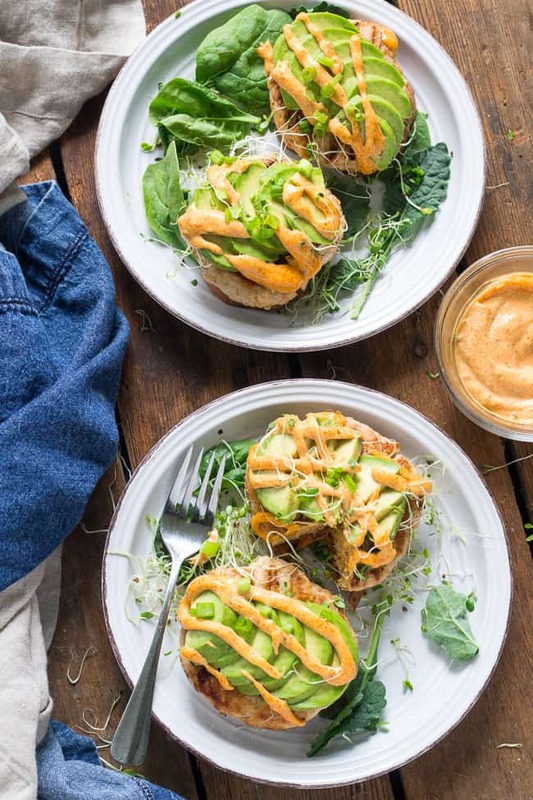 A crispy-on-the-outside grilled sweet potato bun certainly doesn’t hurt either. 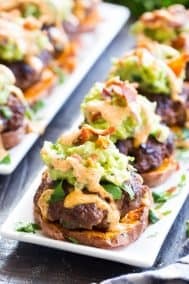 Have you tried out sweet potato buns with your burgers? I am definitely on team bottom-bun-only (if that is in fact, a “team”) and that goes for regular, non-paleo burger buns too. Maybe it had something to do with growing up with a mom who always removed the top bun and ate her cheeseburgers with a knife and fork. I say, there’s no better way to do it, paleo or not! So yes, we grilled some thick slices of sweet potato for our bottom buns, and then top it with a chipotle ranch seasoned chicken burger. 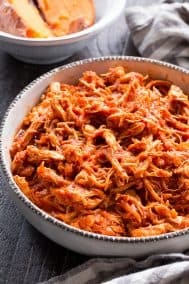 In truth, the recipe as written is too spicy for my younger two kids but perfect for Adam and I and my oldest. 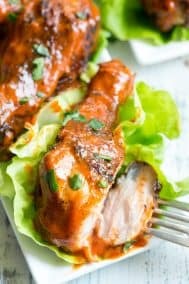 When I make these for the littles, I only add a dash of chipotle powder and no hot sauce. You can also go wild and add more spicy-spices, the recipe is very easy to suit your individual preference. And, let’s NOT forget about the chipotle ranch sauce that tops off these juicy, flavor packed chicken burgers! The sauce is nearly identical (or maybe completely identical?) 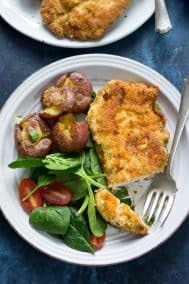 to the one posted with my baked fries, and it’s a favorite for me for so many dishes. For the burgers, I think the chipotle ranch sauce pairs really well with avocado and greens. 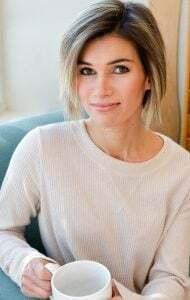 I used sprouts since they looked pretty, but use whatever you like, you cannot go wrong! 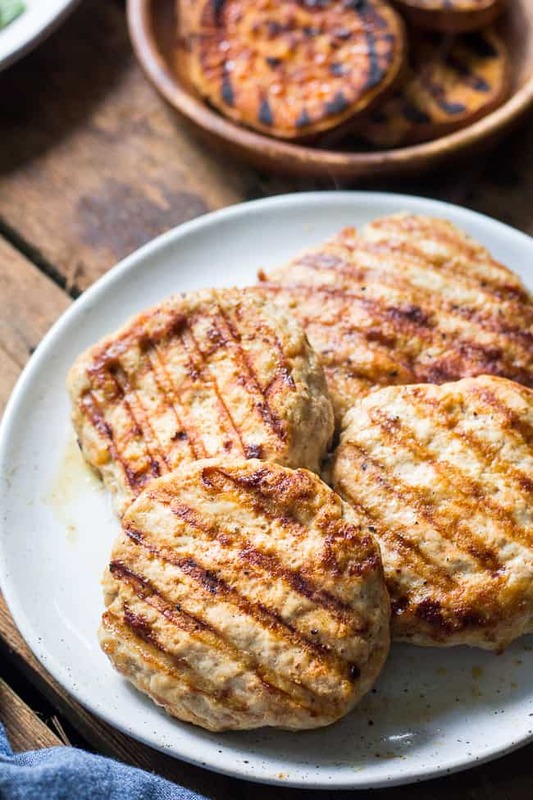 This is a super quick dinner (as in 25 minutes, tops) perfect for grilling season that can easily be doubled as needed and the patties saved and reheated. 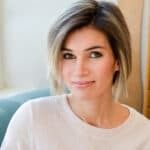 You can even freeze the uncooked patties wrapped in plastic, and then thaw in the fridge the day you want to cook them. And, one note, you don’t have to grill these – you can use a cast iron pan with the exact same result. Year round tastiness! Are you guys ready to EAT these?! Let’s cook! 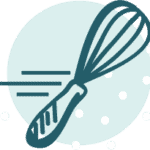 Whisk together all ingredients and either chill in the fridge if making ahead of time, or set aside until ready to use. 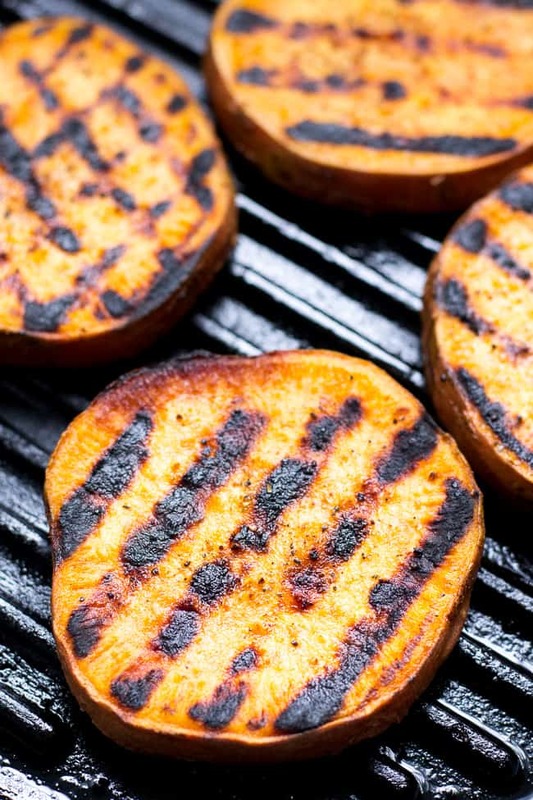 Preheat grill to medium and grill sweet potatoes about 5 minutes on each side while grill is covered, or until they are browned on the outside and fork tender. Adjust the heat if they begin to brown too much. Combine the ground chicken and seasonings (for the burgers) in a bowl and form into 4 patties. Brush the grill well with oil and heat to med/hi heat. 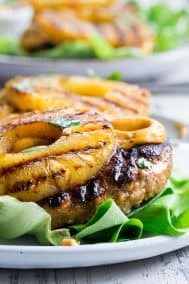 Place the patties on the grill and cook 3-5 minutes on each side, until juices run clear and outside is crisp and browned. 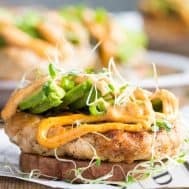 Serve each patty over a sweet potato bun and top with sliced avocado, sprouts or greens, chopped chives or green onions, the chipotle ranch sauce and extra hot sauce if desired. Enjoy! *You can also make both the sweet potatoes and burgers in a large cast iron skillet following the exact same instructions. Want more Paleo grilling recipes? Try one of these! Is everything better in burger form or is it just me? 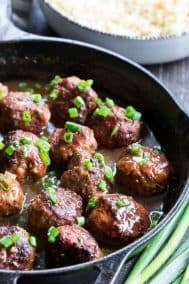 I usually purchase ground turkey, but love changing it up every so often and using ground chicken. These sound amazing since i’m obsessedddd with spicy food! I love burgers, but I don’t think I’ve ever had a chicken burger. 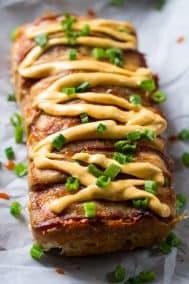 🙂 I love the idea of sweet potato buns. We tried these last night! Oh my goodness, they were fabulous!!!! Thanks for sharing the recipe! I am intrigued by the sweet potato buns but we don’t have a BBQ. How else could you make them? You can make them in a cast iron skillet the same way, OR you could simply roast them at 450, turning once to evenly brown. Hope this helps! Thank you! i baked them at 450 and they turned out great! they held up well. I wasn’t sure if they would just be mushy but it actually worked! I make these what seems like weekly, we LOVE them! So flavorful. Thank you for this great recipe! These were delicious. I left out the chipotle powder from the burgers for my kids and served theirs with Regular mayo. I’m going to need to double the recipe next time! I made these delicious burgers for dinner last night. They were absolutely delicious. My adult son and husband said these were specialty restaurant quality, and they could eat them every day. i have to agree awesome!